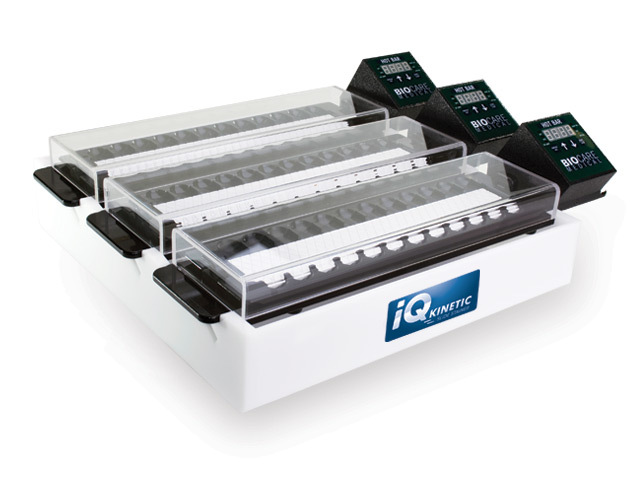 The IQ Kinetic Slide Stainer™ offers the flexibility and reliable performance that both clinical and research investigators need for today’s complex assays. This open system staining platform can be adapted for immunohistochemistry (IHC), in situ hybridization (ISH), immunofluorescence, or special stains. It features an innovative tilt-action rack that eliminates individual slide handling and prevents cross-contamination. The digital programmable HOT BAR™ enables the user to elevate the temperature up to 95°C. The Orbital Shaker provides smooth agitation action for the reagents on the slides. The combination of heat and agitation allows tissues to be evenly and intensely stained while accelerating enzymatic reactions and increasing reagent specificity.